Saffari, H., Makui, A., Mahmoodian, V., Pishvaee, M. (2015). Multi-objective robust optimization model for social responsible closed-loop supply chain solved by non-dominated sorting genetic algorithm. Journal of Industrial and Systems Engineering, 8(3), 42-58. Hamid Saffari; Ahmad Makui; Vahid Mahmoodian; Mir Saman Pishvaee. "Multi-objective robust optimization model for social responsible closed-loop supply chain solved by non-dominated sorting genetic algorithm". 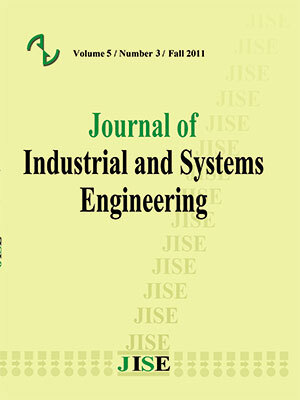 Journal of Industrial and Systems Engineering, 8, 3, 2015, 42-58. Saffari, H., Makui, A., Mahmoodian, V., Pishvaee, M. (2015). 'Multi-objective robust optimization model for social responsible closed-loop supply chain solved by non-dominated sorting genetic algorithm', Journal of Industrial and Systems Engineering, 8(3), pp. 42-58. Saffari, H., Makui, A., Mahmoodian, V., Pishvaee, M. Multi-objective robust optimization model for social responsible closed-loop supply chain solved by non-dominated sorting genetic algorithm. Journal of Industrial and Systems Engineering, 2015; 8(3): 42-58. In this study a supply chain network design model has been developed considering both forward and reverse flows through the supply chain. Total Cost, environmental factors such as CO2 emission, and social factors such as employment and fairness in providing job opportunities are considered in three separate objective functions. The model seeks to optimize the facility location problem along with determining network flows, type of technology, and capacity of manufacturers. Since the customer’s demand is tainted with high degree of uncertainty, a robust optimization approach is proposed to deal with this important issue. An efficient genetic algorithm is applied to determine the Pareto optimal solutions. Finally, a case study is conducted on steel industry to evaluate the efficiency of the developed model and solution algorithm. under uncertain demand and return. Applied Mathematical Modeling, 37(6); 4165-4176. Research Part E: Logistics and Transportation Review, 38; 37-52.
decision-making approach. Decision Support Systems, 48; 224-236.
networks, transaction costs, emissions, and risk. International Journal of Production Economics, 116(1); 61-74.
quality-based product-mix planning. International Journal of Production Economics, 135(1); 209-221.
network design under uncertainty. International Journal of Production Economics, 145(1);184-198. NSGA-II. Evolutionary Computation, IEEE Transactions on, 6(2); 182-197.
for multi-objective optimization: NSGA-II. Lecture notes in computer science, 1917, 849-858.
genetic algorithm. Resources, Conservation and Recycling, 53(10); 559-570.
and reverse channel decisions. IIE Transactions, 42(11); 779-792.
design under risk. Computers & Industrial Engineering, 58(3); 423-431.
recovery on logistics network design. Production and operations management, 10(2); 156-173. Gen, M. & Cheng, R. (2000), Genetic algorithms and engineering optimization (Vol. 7): John Wiley & Sons. Horn, J., N. Nafpliotis, and D.E. Goldberg. A niched Pareto genetic algorithm for multiobjective optimization. Responsibility International Organization for Standardization, Geneva. logistics network for 3PLs. Computers & Operations Research, 34(2); 346-366. Journal of Production Economics, 106(2); 450-467.
flowshop scheduling. Computers & Industrial Engineering, 30(4); 957-968.
design. International Journal of Production Research, 50(8); 2218-2233.
environment. Journal of Cleaner Production, 41(0); 114-125.
network design under uncertainty. Applied Mathematical Modelling, 35(2); 637-649.
mathematical programming. Applied Mathematical Modelling, 36(8); 3433-3446.
network design under uncertainty. Fuzzy Sets and Systems, 161(20); 2668-2683.
forward/reverse logistics network design. Computers & Operations Research, 37(6); 1100-1112.
logistics network design. Journal of Manufacturing Systems, 28(4); 107-114.
supply chain network design: A new approach. Fuzzy Sets and Systems, 206(0); 1-20.
flows. Computer Aided Chemical Engineering, 20; 1075-1080. Schaffer, J.D. & Grefenstette, J.J. (1985), Multi-Objective Learning via Genetic Algorithms. In: IJCAI (Vol. Genetic Algorithm. Genetic and Evolutionary Computation - GECCO, 31; 1214-1225. Srinivas, N. & Deb. K. (1994), Muiltiobjective optimization using nondominated sorting in genetic algorithms. Strezov, V., Evans, A. & Evans, T. (2013), Defining sustainability indicators of iron and steel production. Journal of cleaner production, 51; 66-70.
annealing for a closed loop supply chain network design problem. Applied Soft Computing, 13(2); 1121-1135.
uncertainty: A fuzzy possibilistic-queuing model. Applied Mathematical Modeling, 37(5); 3254-3268. Wang, H.-F. & Hsu, H.-W. (2010), A closed-loop logistic model with a spanning-tree based genetic algorithm. Computers & Operations Research, 37(2); 376-389. Journal of Production Economics, 64(1); 385-397.
strength Pareto approach. Evolutionary Computation, IEEE Transactions on, 3(4); 257-271. Zitzler, E., Laumanns, M. & Thiele, L. (2001), SPEA2: Improving the strength Pareto evolutionary algorithm.